We all have that friend: You’re barely inside her front door and—as your eyes dart from her clutter-free foyer to her perfectly pruned philodendron—you start to question every home decor decision you’ve ever made in your life. Here, seven essential items to invest in to mimic her impeccable style. Step away from the matchy-matchy options that came with your living room set. A better choice is to snap up a range of colors, textures and sizes. Need help laying them out? Try the 2:2:1 rule. 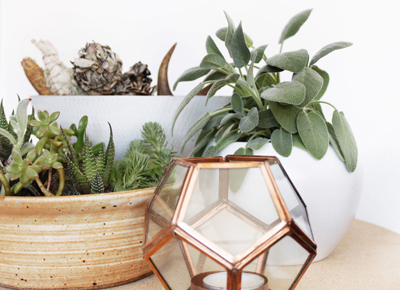 Potted plants—like a well-pruned philodendron or elephant ear—are the easiest way to transform an empty and awkward corner that, up until now, has had zero purpose aside from collecting dust. Concerned you have a black thumb? It’s all about assessing your space (and natural lighting conditions) before you buy. Set out in the right places, they cast a warm and flickering light that instantly cozies up any space. Opt for a scent that isn’t too overpowering, as well as a candle holder—like this floral one from Diptyque—that is chic enough to double as decor. Think the freestanding kind (not the type that has to be nailed into the wall). It serves as another focal point—but one that seamlessly reflects the angles and light of the room to make it feel larger and taller. Whatever you do, don’t let yours become a receptacle for every unimpressive read and knickknack you don’t know what to do with. Instead, put some thought into the titles—and collectibles—on display (and don’t be afraid to play around with negative space).